I have discovered something about quilting. It doesn't make for fascinating blogging. It takes a while and in this case I am making the same thing 25 times before I move on to step two. Each of the 25 things takes about 10 minutes. In other words is a bit of a slow go. Here is my update though. Here is how my flowers are shaping up. I have 15 (the ones on the left) fully together and the blocks all connected. I have a few spares that are put together. This quilt does feature an interesting way of putting the flowers together. Here is a close up of one quilt block. Remember, around the edges the fabric will fray, so the thread will be less obvious. It features two leaves and four flowers layers. You put the leaves on first and then the first layer. Then you cut the inside out. You can see what I am taking about on the back. That way the most layers you are sewing in is two. That is much easier than sewing through five layers. I hope to have this top done by next weekend. I am also joining a shirt a month challenge that Doobee brought to my attention. I need to get on that! 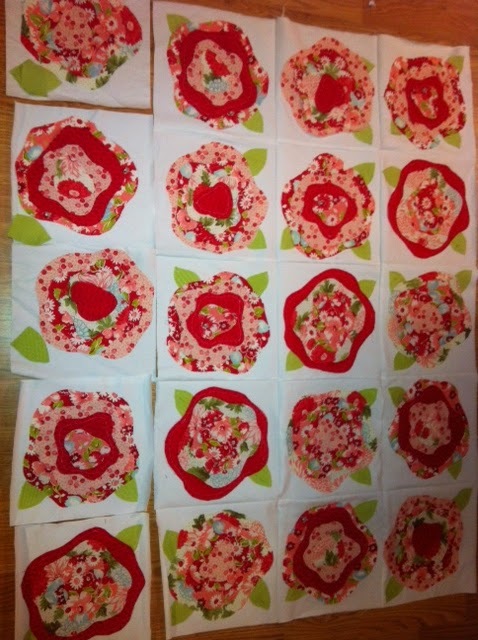 I may do a Clover shirt or an old stand by since the quilt is taking up my time right now. 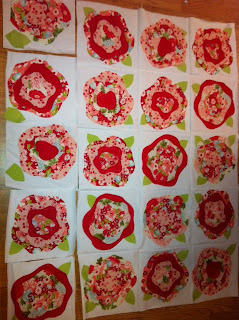 I'm working on one now - French Rose - what does your completed one look like? I'd love to see it!! I've actually made 2 now and loved them both!